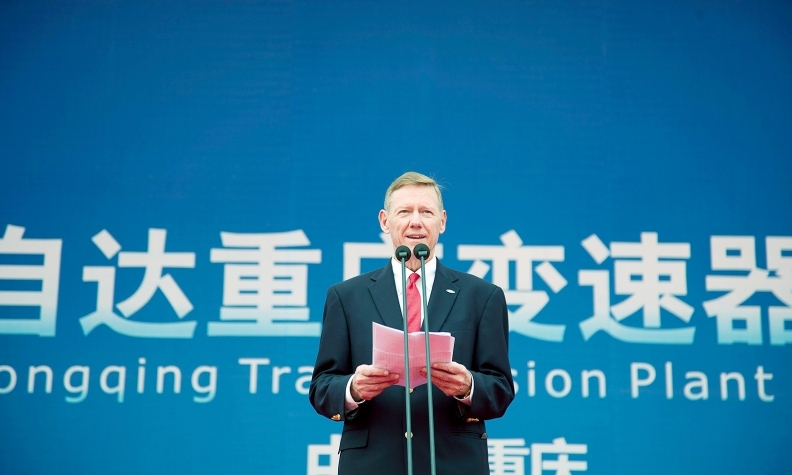 Mulally, at a groundbreaking ceremony for a new transmission plant in China in Sept. 2011, wants to remain a player in the corporate world, giving voice to the importance of manufacturing and innovation in America. DETROIT (Bloomberg) -- Ford Motor CEO Alan Mulally is lining up a substantial corporate position for his next act, probably as a board director or chairman, according to people with knowledge of his plans. The 68-year-old executive isn’t interested in working on his golf game or even in being a college president, said two people familiar with his thinking who didn’t want to be identified revealing private discussions. Mulally has a particular position almost nailed down, which is why Ford is planning to soon announce his retirement and Mark Fields’s elevation to CEO, the people said. Mulally wants to remain a player in the corporate world, giving voice to the importance of manufacturing and innovation in America, the people said. Over 45 years at Boeing Co. and Ford, he became a specialist on management and doing business in Asia, advising President Barack Obama on international trade. Mulally will hand off to Fields, 53, now COO, before the end of the year, according to people familiar with the matter. The company may announce the timing of the change in CEOs as soon as May 1, the people said. Mulally’s management skills are widely admired. Though passed over for the CEO job at Boeing, he revived the company’s commercial-plane business after airlines canceled jet orders in the wake of the 9/11 attacks. At Ford, Mulally instituted a system of developing cars for worldwide markets, rather than narrow regions, which saved money and allowed the company to overhaul its lineup with stylish, fuel-efficient models that have won over a new generation of drivers. Companies like General Electric Co. could benefit from having Mulally on their board, said Clark, who doesn’t have direct knowledge of Mulally’s plans. At GE, which makes everything from jet engines to refrigerators, Mulally would bring decades of manufacturing experience. Seth Martin, a GE spokesman, didn’t immediately return a call seeking comment. Given his aerospace background, an airline would be a good fit, as would high-tech manufacturing companies, Clark said. Mulally is known for helping companies refine their focus. At Ford, he sold off luxury units Jaguar Land Rover and Aston Martin as well as the Volvo cars business to concentrate on Ford’s namesake marque. Procter & Gamble Co. could use that experience as it pares back its businesses to boost profitability. The world’s largest consumer-products maker, which has about 25 brands that each generate more than $1 billion in revenue, earlier this month sold most of its pet-food business to Mars Inc. for $2.9 billion. Paul Fox, a P&G spokesman, declined to comment on speculation Mulally may be headed to the company. After joining Ford in 2006, Mulally got the automaker’s warring factions to work together, encouraged subordinates to share not just good news but bad and brought a data-focused discipline to the organization. Late last year, Mulally was among CEO candidates for Microsoft Corp., people familiar with the matter said at the time. He ended the speculation in January after his candidacy faded over concerns about his age and lack of technology experience, people with knowledge of the matter said. Microsoft named Satya Nadella, its cloud computing chief, CEO in February. Ford may want to keep Mulally on in an advisory role, Press said. That wouldn’t be enough for Mulally, who is energetic and eager to remain active, said Press, who knows Mulally and doesn’t have direct knowledge of his plans.